Last week Lowepro put up a special section on their website highlighting the Toploader Pro camera bag series they released earlier this year. I was sent a prototype of the bag to use while covering the 2009 Wenger Patagonian Expedition Race in February and put it through some serious abuse. Lowepro asked me to put together a PDF with the full story so folks could hear all about the adventures I had down there and I created a modified version of the article that I wrote for my Spring 2009 Newsletter. On Lowepro's webpage they highlight the PDF which you can download here. This glimpse of my adventures is also highlighted on the homepage of their website. As always it is an honor to be chosen by a major manufacturer to test their gear and then be promoted by them. Lowepro has consistently impressed me over the course of the last year that I have been working closely with them - they listen to photographers and modify their existing camera bags to work for us. I have spent hours on the phone with many of the bag designers and they have thought through every feature of the bags with amazing clarity. All of their attention to detail makes my job easier and the camera bags a whole lot more durable and dependable. Those of you that know me know that I don't endorse products unless I use them and recommend them. Before using the Toploader Pro 75 AW I had one of the previous generation Topload Zoom packs which saw occasional use but was certainly not my go to camera bag. Once I started using the new Toploader Pro 75 AW in Patagonia earlier this year I realized just how much more versatile this new incarnation of the top loading bags really is and I find myself using it all the time. It has become the bag I reach for about 90% of the time now when I need to go light and fast or find myself hanging off a huge cliff face. 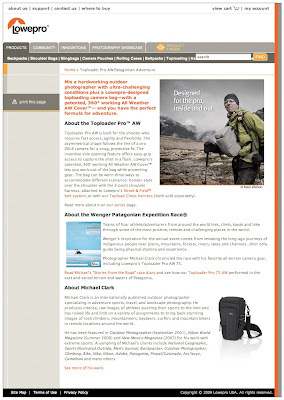 Check out the PDF file listed above to read more about my adventures covering the 2009 Wenger Patagonian Expedition Race and how I used the Toploader Pro 75 AW. I also have to give a shout out to Mark Watson, a good buddy and phenomenal Aussie photographer, who covered the race with me - and who shot the images of me that appear in the PDF, on the website and in a future ad coming to magazines near you this winter. Thanks Mark! And thank you Lowepro. 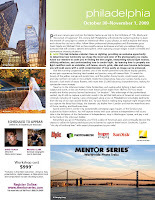 There are still a few slots available for the October Mentor Series Master Class on Lighting taking place in Philadelphia next month. Check out my previous blog post about this workshop for more details. It is sure to be a lot of fun and will help develop your artificial lighting skills using smaller dedicated flash units and larger battery powered strobes. The workshop is sponsored by Nikon, Microsoft, Bogen, SanDisk, Mpix, and Photoshelter. I will be teaching the workshop along with David Tejada and we will have gear from Nikon and Bogen onsite at the workshop so don't delay if you want to get in on this intense and exciting workshop. If you have any questions about the workshop please don't hesitate to contact me.